Hellboy Animated: DON'T READ THIS! 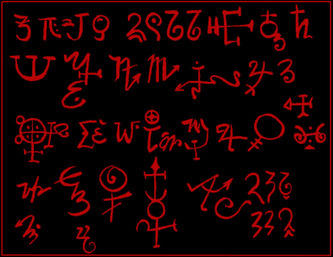 This stuff is okay to read, but don't mess with that mystical scrawl over there. God knows what texts Mignola scavenged to get them. Better safe than sorry. Read them silently. I've gleaned these from the pages of Hellboy comics and from Rasputin's diary which was included in the Director's Cut of Hellboy, the movie. These are purportedly they symbols early alchemists used as they sought the secrets of the universe. Why are they here? Well, much of THE PHANTOM CLAW revolves around the use of Vrill Energy and the "mecha-glove" that Rasputin used to summon Hellboy. Although he wore two gloves in the comic, Mike liked the comparison with the Right Hand of Doom that Guillermo used in the movie so we'll have Rasputin use just one in the animated universe as well. Anyway, the glove is still intact! When the glove is activated, electricity will arc around it but this technology combines technology AND the occult. So image little electrical effects that form mystical symbols in the air before disappearing. A cool idea from Mike that I think we should be able to carry off. But that's not Vril. Vril is an unlimited energy source that bounces in and out of stories of Nazi mysticism. You can read all about the book that first popularized Vril on Wikipedia. In our universe, it is the energy required to bring Hellboy to earth and is sought after in the present by Von Klempt, Zinco and Rasputin, and each has his own plans for it. Interesting article you reference on wikipedia concerning vril, Tad. Some great fodder for the imagination and use in the Hellboy mythos. 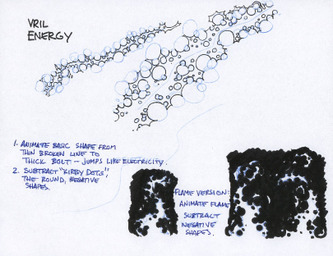 I like your use of the "kirby-dots" to define the shape of the vril energy, not the dots themselves (if I understand right). It would certainly look cool and unlike anything else I've seen. Problematic? Sure, but all the good stuff is. Keep it coming. This looks to be the best one yet! nice. I dig the idea mignola suggested of the symbols appearing momentarily and fading off .....I just hope theres nowhere near as many flashy lights as there were in Sword of Storms...stung my eyes a bit at times witht the strobing. I don't have your e-mail, so I'm going through public means... I just noticed that when you search for our book (ahem... plug) "Liar of Kudzu" on Amazon tonight, it pairs it with Sword of Storms as a "buy with." I have no idea why. Then again, many things are mysterious on Amazon. No doubt by the time you check, it will be paired with something else, equally inexplicably. Interstingly, they've never paired it with any Kim Possible stuff, which would actually make sense. Oh well, we'll take the curious Mignola fan any day!